This site was developed to provide these disclosures in one coherent location. Please follow the links below for information on each of the topics listed. For questions, please contact the appropriate office. The number of graduate assistant (GA) positions varies from year to year. The positions are available, by application, to full-time graduate students. The GA appointment is equivalent to 3 credits of registered coursework; therefore full-time study with a GA appointment is 6 credits of registered coursework. Teaching assignments are available in the clinical and simulated laboratories theory/lecture courses, or as an assistant to a full-time faculty member. Research assignments can be in the Center for Nursing Research, or in support of MS and PhD faculty research. All Graduate Assistants are hired from August 23rd to January 7th for the Fall semester and January 8th through May 22nd for the Spring semester. GA’s work 20 hours per week. If a GA is not able work on a particular week she/he is expected to make up the time missed. Work schedules are negotiated with the designated supervisor. GA’s are required to attend an orientation prior to initiating employment to be arranged with the supervisor. All GA’s, regardless of their assignments, are required to work during final exams as proctors or other assignments as needed. GA’s receive a tuition waiver (not including fees) and bi-weekly stipend. (See Graduate Catalog for information and fees). Graduate assistants may purchase healthcare coverage, heavily subsidized by UConn. For more information on healthcare benefits go to the Human Resources web page. All positions will be advertised to incoming and continuing students. Interested students must be available for an interview with a prospective supervisor. The positions are competitive. Appointment is based on academic merit and expertise in skills required of the position. Continuing appointment is dependent on satisfactory performance. Traineeship funding is available through the Federal Advanced Education Nursing Traineeship grant to the School. 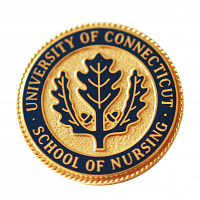 The Health Resources & Services Administration notifies the School of Nursing in the summer concerning the amount of funding available for the coming academic year. To be eligible, students must be enrolled full-time (9 credits each semester, or 6 credits with a graduate assistantship) enrolled part-time and in the last 12 months of their doctoral program. Funds are available for tuition assistance on a semester by semester basis, and as funding allows. Students will be notified of the application procedure via listserv announcements. Other sources of financial aid may affect the amount of the traineeship award a student receives. The traineeship award is applied to the student’s fee bill. These fellowships are awarded by The Graduate School on the recommendation of the School of Nursing. Predoctoral fellowships are available for the fall and spring semesters. Award amounts vary and are given to full-time doctoral students. Recipients must maintain satisfactory academic progress toward their degree. Graduate eligibility for financial aid and calculation of need for campus-based programs will include resources such as anticipated fellowships, Federal Stafford loans, veteran’s benefits, outside scholarships, tuition waivers and need-based student earnings during an award year. Over awards will require recalculation and may result in a reduction of financial aid. Summer Fellowships are awarded by the Graduate School based on the recommendation of the School of Nursing. Recipients must have an approved dissertation proposal on file to be eligible for this award. The award amounts vary year to year. Students do not have to be registered during the summer but must be making progress toward the completion of their degree. An applicant to the doctoral program who demonstrates outstanding potential as a nurse scholar is eligible to be considered for a special Graduate Assistant award. A maximum of two outstanding awards are given each year. The award is for three consecutive years and includes: a 10-hour (part-time) Graduate Assistant position (including tuition, stipend, and eligibility for discounted health benefits). The New England Regional Student Program offers special rates to out of state students enrolled in certain graduate programs at UConn. Information can be obtained from the Graduate School. Students are encouraged to apply for larger amounts of NRSA funding from the Federal Government. Funding was initiated in 1974 to increase capabilities of the National Institute of Health (NIH) to carry out their responsibility to maintain superior national programs of research and study of physical and mental diseases or impairments. Doctoral students may qualify for a pre-doctoral fellowship which funds both the student and in a lesser amount, the sponsoring institution. Students will need to identify a specified area of study and a research mentor. Applications are available from the Director of the Center for Nursing Research and from the University’s Research Foundation. Submission deadline date for this semiannual competition is usually June 1. Opportunities through the University are listed in the Graduate School Catalog. Special Graduate Student Assistance is available through the Graduate School. Additional information may be obtained on the Financial Aid Office web site. Please note: FASFA applications need to be completed for all financial aid. This program provides fellowships, through academic departments and programs to assist graduate students with excellent records who demonstrate financial need and plan to pursue the highest degree available in their course study at the institution in a field designated as an area of national need. The program provides tuition, fees and a stipend for FINANCIALLY ELIGIBLE PhD with a major in nursing students with an interest in teaching. A supervised teaching experience and participation in a learning community are required.